Genealogists are always looking for more information about their ancestors. For many genealogists, only having the birth, marriage and death dates is just not enough to tell an ancestor’s story. 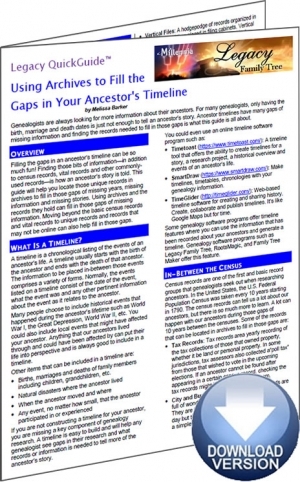 Ancestor timelines have many gaps of missing information and finding the records needed to fill in those gaps is what this guide is all about. The Using Archives to Fill the Gaps in Your Ancestor's Timeline Legacy QuickGuide™ contains useful information including how to use timelines to determine gaps in your research. Also included are links to websites and resources covering the best record sets found at an archive or repository for filling in gaps and more. This handy 4-page PDF guide can be used on your computer or mobile device for anytime access.